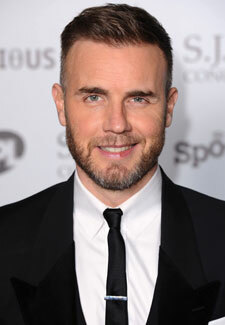 Gary Barlow might be down on his luck on The X Factor after losing Kai at the weekend, but after winning a top music industry award, he’s got something to smile about. He was honoured with a Music Industry Trusts Award and was presented with the award by past winner Elton John, while Prince Charles paid tribute to Gary in a video message from his jubilee tour of Australasia. Gary, 41, was joined by Take That bandmates and wife Dawn at the bash, with fellow X Factor judges Louis Walsh, Nicole Scherzinger and Tulisa also in attendance. ‘I’ve been doing this for 22 years now,’ said Gary. ‘And the one thing that’s more apparent to me that ever before is how much I love performing. Check out the best looks from the red carpet here.